The soldier from the middle of the group holds a Romanian flag with the right hand. Accordingly to the pamphlet of the coin, the soldier is waving victoriously the flag. The flag dimensions correspond to a civil flag. We expected a soldier victorious in war to wave a military flag, but military flags of the time had a square shape and bore the Romanian coat of arms in the middle. The colors of the Romanian flag are red, yellow and blue, with the blue colour placed near the flagstaff. On the coin the colour near the flagstaff is hatched vertically and the most distant colour is hatched horizontally. The conventional black and white representation of the colours in heraldry use vertical lines for red and horizontal lines for blue. If the color symbolisation was intended, then the representation is wrong, being inverted. If it is was not, we have the right to ask about the meaning of the hatches on the flag. The three soldiers on the cois are a vînător (jaeger), a dorobanţ and a roşior (from the left to the right). The roşiori were cavalrymen, named after the colour of their uniform - roşu meaning red in Romanian. The infantrymen were named dorobanţi or darabani, being the main part of the army. They were nicknamed căciulari or curcani, because they worn a turkey feather at the cap. Căciulă means in Romanian a cap made from sheep fur, with the hair on the outer side. Curcan means turkey. 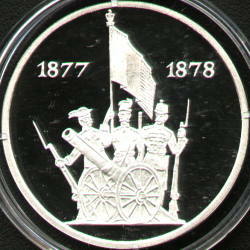 It is very possible that the three soldiers represented on the coin are three soldiers distinguished on the battlefield and not some generic soldiers. The first of them could be Ion Grigore, from the 2nd Jaegers Battalion, that captured a Turkish flag in the fight during which the fortification of Griviţa 1 was taken. He was helped by corporal Vasile Nica and by sergeant Gheorghe Stan. These soldiers killed the three Turkish soldiers that were guarding the flag. The dorobanţ could be the sergeant Constantin Ţurcanu from the 13th Regiment, 2nd Battalion from Vaslui. The sergeant was immortalized by Romanian poet Vasile Alecsandri under the name Peneş Curcanul (Feather the Turkey). The 13th Dorobanţi Regiment gained the military glory in the battle of Plevna (in Bulgaria, today Pleven). The soldiers of the 13th Regiment conquered, on 27th August 1877, the redoubt lying in front of the fortification of Griviţa 1, the first major success of the Romanian troops in the battle for Plevna. The soldiers were rewarded with important Romanian and Russian medals and decorations. The roşior could be soldier Vasile Mohor, the one that captured, in a cavalry skirmish on September 5th 1877 near Isker River (Iskur or Iskar, old Latin name Oescus), another Turkish flag. Se non è vero, è ben trovato. 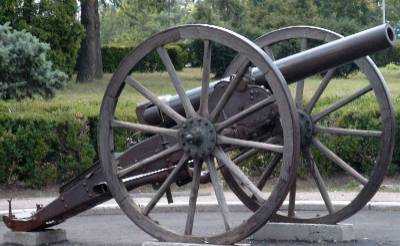 The cannon in picture date from the Independence War. It is one of the two cannons flanking the statue of Stephen the Great and the Holy in the front of the Culture Palace in Iaşi. The cannon was made in Germany, at Krupp, and it is of 75 mm caliber. 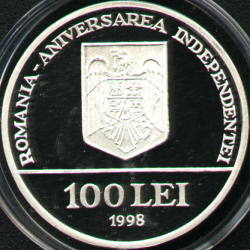 The coin celebrates the 120th year of Independence. The tombac (Dutch metal, an alloy of copper and zinc) pattern pictures above are present on Romanian coins through the kind permission of Mr. Alex Lazarovici. The metal pattern is somewhat dubious. In paper "Proiecte de monede şi medalii emise de Banca Naţională a României în anii 1997 - 1999” published in volume "Cercetări numismatice VIII" Mr Ştefan Ursachi, the coin's designer, states that he had seven face patterns made - 4 obverses and 3 reverses (though no reverse presented matches the one of the pattern hereabout pictured). 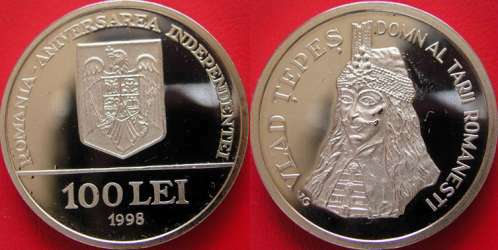 The obverse is exactly the one of the official issue, and the obverse shows the image of prince Vlad Ţepeş (III Dracula), image unfit for the anniversary.